The Boston Modern Quilt Guild is making charity quilts this year and members have been asked to donate blocks made with fabrics that are from the same color family. The quilts will then be made with a rainbow of the different color grouped blocks. I came up with a strategy for my blocks which involved sorting all of my fabric scraps by color and then selecting strips from each pile and sewing them together. After sorting the strips I trimmed them so they were all about the same length and so that each strip was a uniform width, but the strips are various widths! Then I sewed them together. For the blocks that I decided to make I made sure that the pieced strips panel was 38″ long and about 15″ wide. This is enough to make several blocks. You do need a 38″ long strip for the log cabin block featured in this article. Trim the uneven edge and don’t forget to save your scraps that are too small to sew with. These will be the stuffing for a pillow! 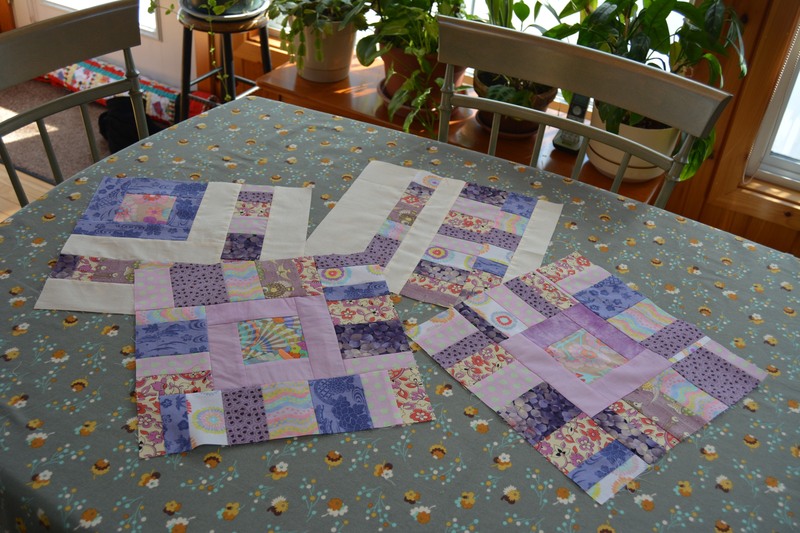 I cut my pieced strips 3 1/2″ wide and some are 2″ wide. One of the block designs is a log cabin block. 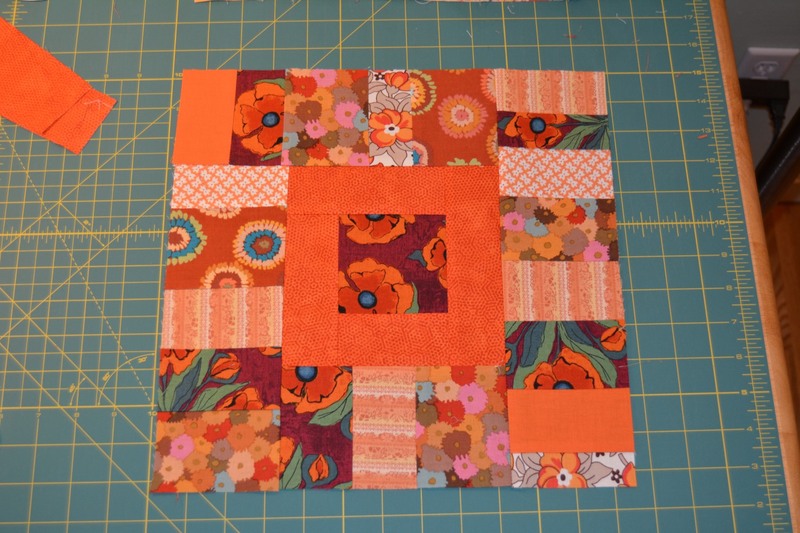 This block uses one of the 3 1/2″ wide strips with other fabric scraps. 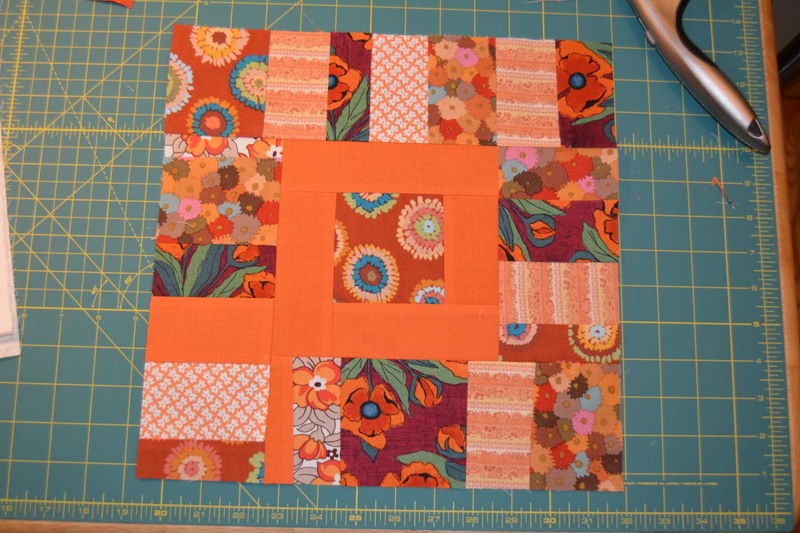 The center is a 3 1/2″ square bordered with 2″ strips. Sew the strips and then trim them to the correct size. Use a square ruler to make sure your cuts are correct. The center block will be 6 1/2″ square. 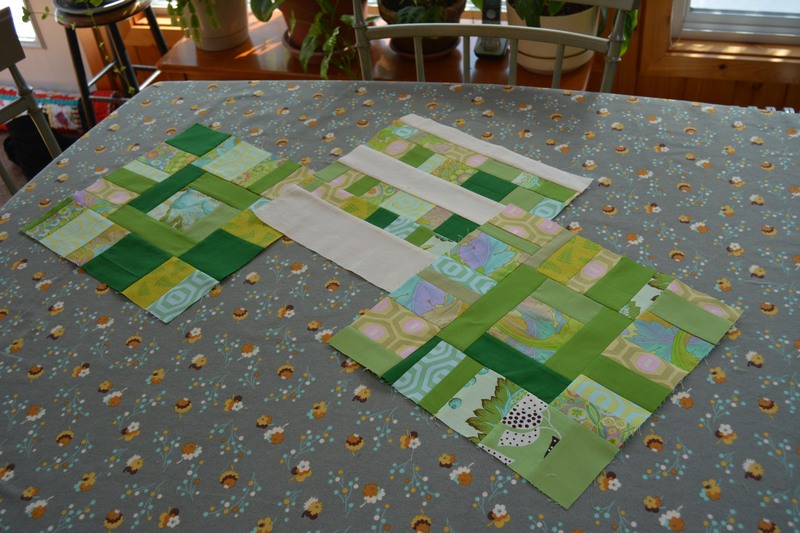 Then continue adding the 3 1/2″ wide pieced strips. Sew then trim to the correct size as you go. Once the block was larger than 6 1/2″ I got out my 12 1/2″ ruler to trim the block. Here are some made with purple and green strips. Of course I got carried away and will be making a lot of these blocks, so I will make my own quilt with these blocks. Usually I would use all different colors, but I really love the idea of using strips that are in the same color group. The finished blocks are sublimely wonderful. This entry was posted in Boston Modern Quilt Guild, Patterns, Quilts and tagged blocks, improvised, modern, quilt, scrappy on February 20, 2015 by pmegio. 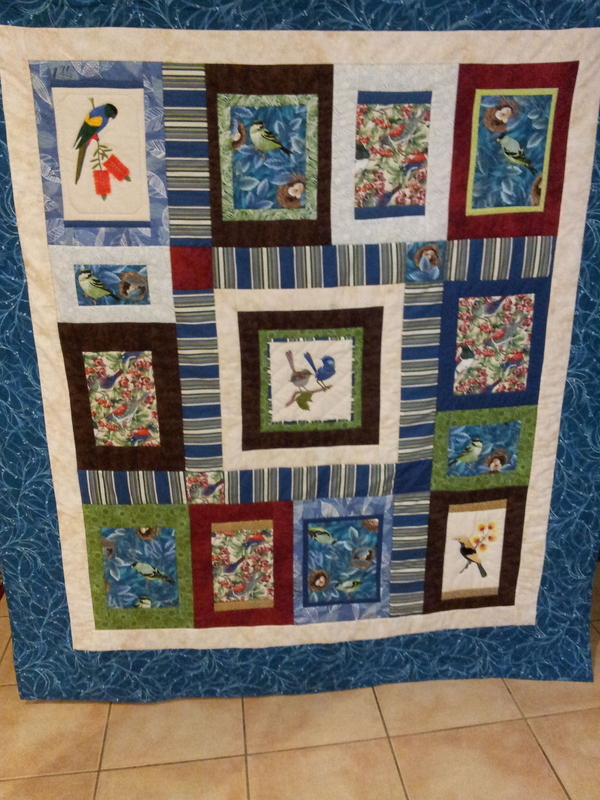 I wanted to thank Janette for sharing a photo of her bird quilt with me. 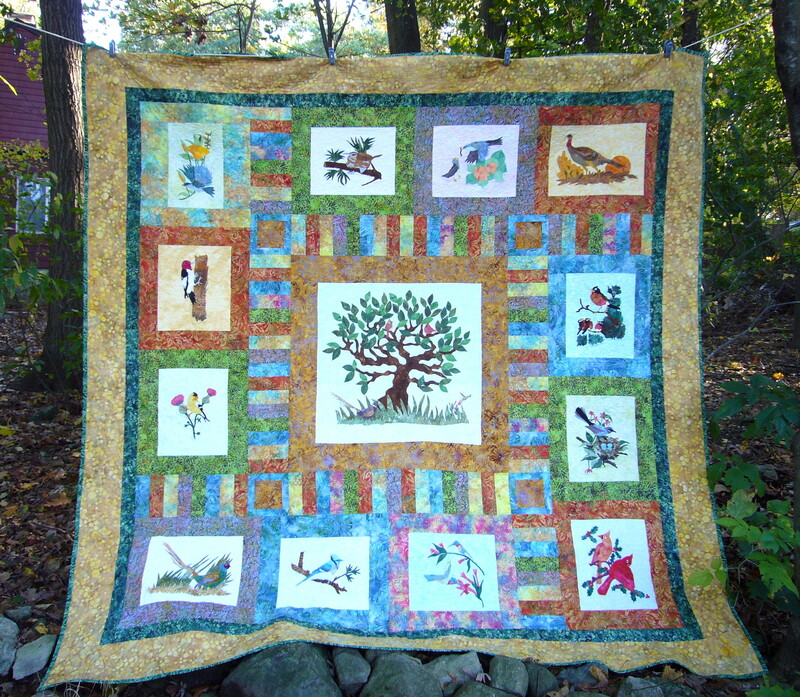 You can see that she was inspired by my bird quilt to create her own quilt with her bird fabrics. Because Janette had an idea of how she wanted to put her quilt together before she prepared the blocks she did not end up with Y seams like I did! Sometimes a little planning makes sense even if you are improvising. I am so happy that I was able to inspire someone with my bird quilt and would love to hear from anyone who has been inspired by my blog! This entry was posted in Quilts and tagged improvisational quilt, modern on October 9, 2014 by pmegio. I started this Lorax quilt quilt ages ago. I quilted it as planned with the Zephyr, panto that looks like the Truffula trees .. and then it just hung out on the quilt frame like clothes on a tread mill for months! Finally during my unexpected break from work I got around to putting the binding on it. I suppose it is controversial to quilt right over the Lorax but I don’t think it matters to him. Think of it as a screen overlay and don’t worry about adding a panto over a panel. I think it works just fine. This entry was posted in Pantos, Quilts and tagged Dr Seuss, lorax, lorax quilt, modern, panel, pantograph, quilt, quilting, seuss, zephyr on November 4, 2013 by pmegio. I was finally able to make it to a Boston Modern Quilt Guild meeting and was pleased to discover that they were still looking for help with the Quilts for Boston project. Alice gave me a bag which I thought was a top to quilt, but I discovered a collection of blocks that needed to be pieced. I had great fun arranging all of the blocks, including a strip of tumbler blocks, some very modern blocks and also traditional star blocks. I really enjoyed having the opportunity to put this quilt together which will go to someone who was directly affected by the Boston Marathon Bombing or I think it may also go to someone who has helped in the healing process. I could really feel all of the love that went into making all of the blocks in this quilt. This entry was posted in Quilts and tagged block, boston, guild, marathon, modern, quilt, tumbler on November 1, 2013 by pmegio. October has been flying by with very mild weather and lots of beautiful color throughout the New England Area. I managed to get all of my October Jane blocks finished and have gotten a start on the ones for November. November will finally see more green! Pat, our fearless leader at Quilters Common has been trying to get a mix of blocks each month … paper piecing, rotary cut, applique, and always one triangle, otherwise we would never get to them! But, this means I have no idea what colors I will be using for fabric each month. For the last two months the colors have been lots of yellow, orange and red, so I am happy to be picking out some green fabric for November. Block M-8 ended up looking quite warped so I went ahead and added the sashing pieces. I am following advice from Aunt Reen’s Blog for the sashing. With the sashing in place it looks just fine now. This entry was posted in Dear Jane, Patterns, Quilts and tagged dear jane, kaffe fabric, modern, pattern, quilt on October 18, 2013 by pmegio.